Christmas 1914 was a unique period. Britain had gone to war against the Central Powers some four months previously, and with optimism it was believed this would be over soon and the troops would be home to enjoy their respective celebrations. The festive period produced a relaxed atmosphere on many parts of the Front, and there were many reports of fraternisation with the enemy. In Britain and its Empire, the hearts of the People went out to troops who were facing a Christmas away from loved ones back home. Various organisations and members of the public were generous in their supply of food, tobacco, warm clothing and other treats for the soldiers at the Front and the sailors afloat. On October 14th, the Princess Mary's Christmas Gift Fund was launched with subsequent advertisements placed in the national press inviting monetary contributions to a "Sailors and Soldiers Christmas Fund". Created by Princess Mary, the 17 year old daughter of King George V and Queen Mary, its purpose was to provide everyone on Active Service on Christmas Day with a "gift from the nation". "I have delayed making known a wish that has long been in my heart for fear of encroaching on other funds, the claims of which have been more urgent. I want you now to help me to send a Christmas present from the whole nation to every sailor afloat and every soldier at the Front. On Christmas Eve when, like the shepherds of old, they keep their watch, doubtless their thoughts will turn to home...I am sure that we should all be the happier to feel that we had helped to send our little token of love and sympathy...something that would be useful and of permanent value and the making of which may be the means of employment in trades adversely affected by the war". Indian troops received candy and spices, whilst hospital nurses, who were included as recipients, were treated to chocolate. After Christmas 1914 a surplus of funds enabled the scheme to be extended. A simpler gift was given out to all other servicemen ('Classes B and C') which consisted of a bullet pencil and a New Year card. Orders for brass strip were placed with the USA, who were not yet involved in the War, and a large consignment was lost with the sinking of the ship "Lusitania". 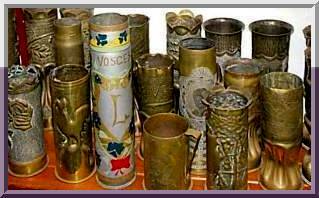 As so much brass was being consumed in the production of weapons and munitions, the quality of the tin boxes which were manufactured late, was poor, being of a plated inferior alloy when compared with the earlier pure brass examples. It has been stated that the superior quality brass tin boxes were reserved for the Officer Class, although no evidence now exists to support this. When the Fund was wound up in 1919/1920, almost £200,000 had been donated for the provision of more than two and a half million tin boxes with contents. Surplus funds were transferred to Queen Mary's Maternity Home for the wives of servicemen. The box is approximately 12.5 cm long x 8.5 cm wide x 3 cm deep with a double-skinned, hinged lid. The surface of the lid depicts the head of Princess Mary in the centre, surrounded by a laurel wreath and flanked on either side by the "M" monogram. At the top, a decorative cartouche contains the words "Imperium Britannicum" with a sword, bayonet and scabbard (for the Army) either side. On the lower edge, another cartouche contains the words "Christmas 1914", which is flanked by the bows of two Dreadnnoughts (for the Royal Navy) forging through a heavy sea. In the corners, small roundels house the names of the Allies: Belgium, Japan, Montenegro and Servia; France and Russia are at the edges, each superimposed on their furled flags or standards.